African Union (AU) Commission President Moussa Faki Mahamat is currently paying a two-day working visit to Morocco before a trip in the Tindouf camps in Algeria. Mahamat’s visits are part of preparations for the 31st African Union Summit scheduled for next July in Nouakchott, Mauritania. 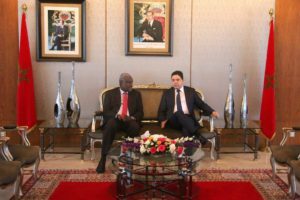 The visit of the AU official to Morocco coincides with the tour Polisario Front leader Brahim Ghali undertook in four southern African countries from May 27 to June 5. If the trip of the President of the AU Commission is justified by his will to prepare the files, including that of the Sahara, to be debated at the coming African summit, Brahim Ghali’s visits to Namibia, Lesotho, Botswana and South Africa, mainly sought to mobilize the support of the leaders of these countries to the chimerical causes of the so-called Sahrawi Republic “SADR”. Following the diplomatic offensive undertaken by Morocco since its readmission to the African Union at the end of January 2017, the number of Polisario’s allies has shrunk drastically. The separatists are losing ground even in southern Africa where, today, only 8 of the 15 member countries of the Southern African Development Community (SADC), still recognize the pseudo-SADR. The Polisario, which has been strongly shaken at the United Nations and within the European Union, is losing momentum on the African chessboard. Also, it can no longer count on the Algerian diplomatic machine that has run out of steam and has been seriously tarnished by the witch hunt against sub-Saharan migrants who have ventured into Algerian territory. The inhuman treatment reserved by Algerian authorities for sub-Saharan migrants will be one of the hot issues to be debated at the 31st African Summit. Algerian rulers, Polisario leaders and their traditional allies are very likely to be disappointed by the recommendations to be adopted by the Nouakchott summit on these two issues of the Sahara and African migrants. What is certain for the moment is that Morocco, banking on UN Security Council Resolution 2414, is not ready to concede to the African Union the slightest role of arbitration in the territorial dispute opposing it to the Polisario and its Algerian sponsor.